As a 9-year-old terrier mix, Griffin, also known as Griffy, likes to spend his days playing with his parents Jamie and Timothy. Griffy’s parents adopted him when he was just 9-months-old, saving him from a hoarder that owned him in addition to 52 other dogs. Griffy resides in sunny California and enjoys zooming back-and-forth in his yard. When he gets tired of exercising, he likes to relax and make himself comfortable on his dog beds. He also enjoys playing with his no stuffing toys and taking trips to Grandma’s house for love and treats. “He’s been through so much, but he really still is such a sweet boy,” said his mom, Jamie. In April of 2018, Jamie and Timothy noticed that one of Griffy’s teeth broke off. Jamie felt something was off about him and took him to see his primary veterinarian. He was given medication for his tooth and started to feel better. After some time passed, they noticed that Griffy got up and collapsed onto his bed twice and that he would let his tongue hang out of his mouth. Jamie did some research online and got concerned about the symptoms, which encouraged her to schedule an appointment at SAGE Centers for Veterinary Specialty and Emergency Care in San Jose, CA. There, he received several tests and his family learned that Griffy had a meningioma, a type of tumor, on his brain. 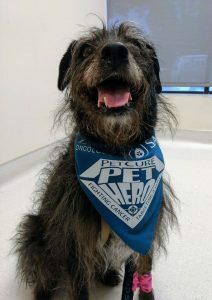 Griffy’s doctor’s recommended that he visit PetCure Oncology for stereotactic radiation (SRS/SRT) treatment with Dr. Lauren Quarterman. Griffy’s parents began researching stereotactic radiation on the internet to learn more about the treatment and the benefits of treating his aggressive brain tumor. With stereotactic radiation treatment, Griffy would need much fewer treatments than with traditional radiation therapy and it would mean less time under anesthesia and a faster recovery time in general. They ultimately decided to proceed with the SRS/SRT treatment feeling confident. “We were given a lot of information and it was really helpful,” Jamie explained. Griffy received three fractions (treatments) of SRS/SRT at PetCure Oncology at SAGE. Immediately following treatment, Griffy was a little tired but otherwise in good shape. He was eager to get back to exercising and now is roughly 85 percent back to his pre-cancer self, according to his mom. He is back to playing with his bones, going for mile long walks, and eating normally. 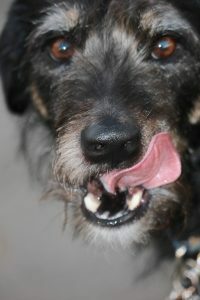 Griffy will continue to have follow-ups with Dr. Quarterman at PetCure Oncology to track his progress. Griffy’s mom has learned a lot through this process and recommends all pet owners should trust their gut and get things checked out when they notice a change in their pet. It’s better to be safe rather than sorry.